The four-week Investigator voyage will survey seamounts in and near the Huon and Tasman Fracture Australian Marine Parks off southern Tasmania, and on St Helens Seamount off eastern Tasmania. If time allows, coral communities will also be surveyed at Big Horseshoe Canyon, Bass Strait, and Cascade Plateau off south-eastern Tasmania. 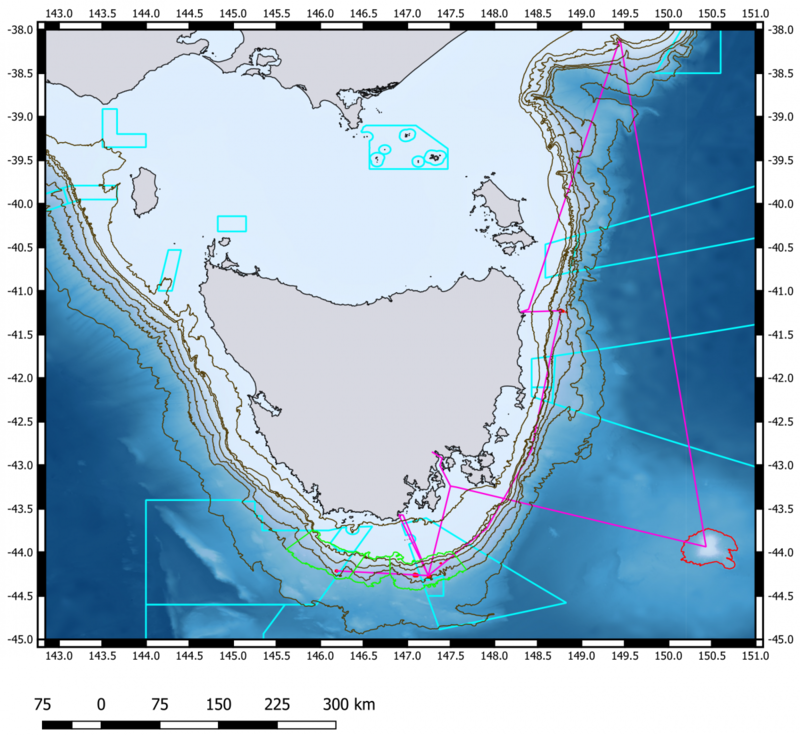 The RV Investigator voyage will survey mid-slope (~700–2000 m depth) seamounts in and near the Huon and Tasman Fracture Australian Marine Parks (AMP) off southern Tasmania, and on St Helens Seamount off eastern Tasmania. If time allows, coral communities will also be surveyed at Big Horseshoe Canyon, Bass Strait, and Cascade Plateau off south-eastern Tasmania. The voyage builds on 1997 and 2007 seamount surveys conducted in the Huon and Tasman Fracture AMPs, a 2008 survey at St Helens Seamount, plus parallel New Zealand studies in 2001, 2006, 2009 and 2015. It will be the most comprehensive mapping of deep coral habitats and biodiversity off Tasmania, in and out of these reserves, and the data will be used to assess the status of deep-sea coral communities and their recovery from trawling, including multi-species and successional changes. Importantly the survey will attempt to establish the total coverage of deep-sea coral communities in this area, providing a better perspective on the importance of the iconic seamount communities. St Helens Seamount (heavily trawled). These surveys will also ‘ground-truth’ predictive maps of coral community distributions prepared before the voyage. These maps predict where corals are likely to be present, based on whether an area is on or off seamounts, trawled or untrawled, and at certain depths [‘shallow’, ‘deep’, or ‘very deep’ (500, 1100, 1350, 2000 m)]. Globally these predictive models overpredict where corals occur, and biological and physical data collected on this survey will be used to refine these models and hence global predictions. Other survey activities will include CTD water chemistry sampling, static camera drops for close-up imagery, and biological collection with beam trawl and benthic sled. Gaps in the seabed mapping of the study area will be covered with the collection of multi-beam sonar data. DeepBRUVS baited-video samplers will be deployed at sites including the Patience Seamount (a basketwork eel spawning aggregation in the Huon AMP), and potentially at Flinders Canyon. Line fishing (power reel and rod) will be used to sample basketwork eels at Patience Seamount. Patience seamount is the only deep sea spawning aggregation discovered for eels world-wide. Two ancillary projects will also be completed: an acoustic target strength study and acoustic transects over many seamounts will advance methods for estimating orange roughy populations, whilst seabird observations will be recorded throughout the voyage. The new understanding of changes in coral communities through time will guide future planning by the Australian Government and globally to monitor and manage deep-sea coral reefs as conservation assets. The results will also be relevant to understanding and managing the effects of fishing on comparable deep-sea coral communities, including in High Seas areas beyond national jurisdiction.